08.08.2018: IMSA Continental Challenge @ Elkhart Lake Compass Racing returned to victory in the TCR class of the IMSA Continental Tire SportsCar Challenge during the Road America 120 at Elkhart Lake. 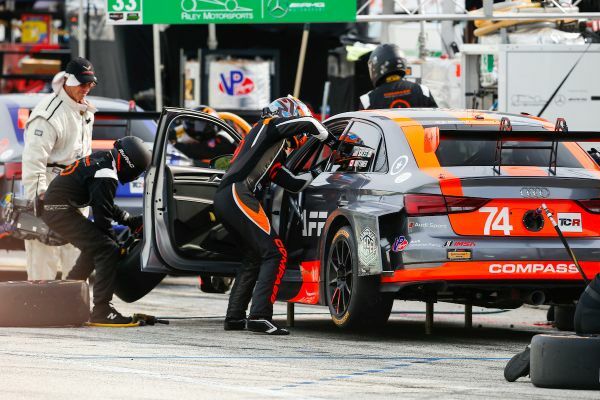 Compass Racing returned to victory in the TCR class of the IMSA Continental Tire SportsCar Challenge during the Road America 120 at Elkhart Lake. Leading the way was the #74 Audi RS3 LMS of Rodrigo Sales and Kuno Wittmer, who earned their third win of the season and the team’s sixth. They cycled into the lead after the mid-race pit stops on Lap 22 and stayed there for the remainder of the race. However, it wasn’t without a little drama at the end, as fellow teammate Britt Casey Jr. in the #77 Audi closed the gap and pulled alongside Wittmer in the closing laps, but was never able to move ahead. Casey Jr. and co-driver Tom Long finished second and lost their one-point lead in the championship standings to Wittmer and Sales who now lead by two (225 to 223). Finishing on the podium for the fourth consecutive race were Michael Johnson and Stephen Simpson in third place behind the wheel of the #54 JDC-Miller Motorsports Audi. It was a black day for the eEuroparts.com Racing that had both its Audi cars – including the #12 of O’Gorman-Koch that started from pole position – eliminated in the early minutes of the race, as they were caught in a pile-up caused by cars of the GS class. The IMSA Continental Challenge will race again in two-week-time at Virginia International Raceway. Daniel Lloyd of the WestCoast Racing team has extended his overall lead in TCR UK.